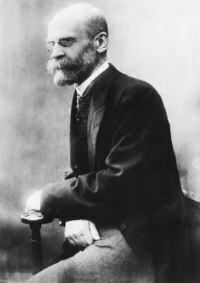 David Émile Durkheim (French: [emil dyʁkɛm] or [dyʁkajm]; Aprile 15, 1858 – November 15, 1917) wis a French sociologist, social psychologist an filosofer. He formally established the academic discipline an — wi Karl Marx an Max Weber — is commonly citit as the principal airchitect o modren social science an faither o sociology. ↑ Craig J. Calhoun (2002). Classical sociological theory. Wiley-Blackwell. p. 107. ISBN 978-0-631-21348-2. Retrieved 19 March 2011.